This Professional Countermeasures Kit from the 1960's and 1970's. 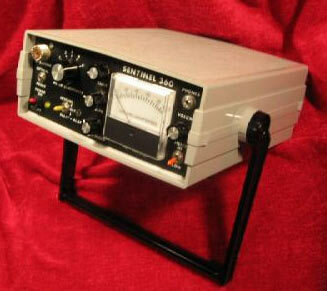 If you had this unit, you were considered a high-end countermeasures service. The same units where used by federal law enforcement. 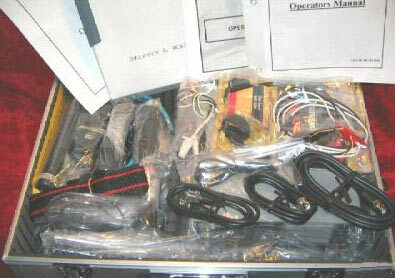 The Kit Included: Infrared Probe, Near Field Probe, Wand Antenna, Spherical Loop Antenna, AC/DC Charging Transformer, (2) Sets Headphones, Acoustic Leakage Detector Probe/Contact Microphone, Countermeasures Amplifier w/Accessories, AlumaClad Professional Carrying Case with Shoulder Strap, Factory Instruction Manuals, and full compliment of Accessories and Cables. This countermeasures set is a complete professional set containing all of the essential pieces of standard test gear for the TSCM professional. The Martin Kaiser Sentinel 360 is an absolute top of the line professional countermeasures receiver from the most prestigious world renowned countermeasures company. This item is in “As New” condition, has recently had new rechargeable gel cell batteries installed and has been completely electronically serviced and is in perfect operating condition. This is professional government level equipment substantially more sophisticated and sensitive than countermeasures receivers offered in the civilian arena. The Sentinel 360 is top of the line in professional equipment, and has all the professional features needed to locate RF bugs and transmitters up to 10 Gigs, including optical infrared devices. It will additionally detect surreptitious devices on the telephone lines. The unit comes with a complete countermeasures equipment set including all accessories and is all contained in a new professional AlumaClad carrying case. The 360 contains industry standard electronic components that can be serviced by Martin Kaiser Inc or any competent electronics shop. There are no throw away circuit boards, no micro surface mounted electronics or other inexpensive components. This unit is designed and manufactured to last indefinitely. The Kaiser 360 Sentinel features built in rechargeable gel cell batteries which provide over 40 hours of continuous operation and are charged by the AC/DC transformer charger. The charger initially provides a fast charge and then automatically switches to a float charge to maintain full charge without overcharging the batteries. The unit has an adjustable handle that can be rotated to serve as a support for bench usage or moved to the standard handle position for carrying around during a sweep. The unit provides 5 levels of fully adjustable sensitivity settings, in addition to a limit circuit, zero circuit, threshold circuit, multi-function instant and delay alarm mode and filtering. These are features that are only found in professional level equipment. The unit has a built in speaker and a headphone output jack for silent non-alerting mode. It additionally has audio demodulation to verify any received signals. With the threshold circuit and alarm mode, the unit can be used for remote monitoring or can be used in the alarm mode to activate if any RF signal that exceeds the threshold which is fully adjustable. This for example would be valuable during a business meeting when someone would enter with a body wire microphone and transmitter or similar device. The alarm mode can be set to audible or silent with a visual flashing light on the front panel that activates when the threshold is exceeded. In addition to the standard alarm circuit the unit also incorporates a selectable delay circuit where someone would have to remain in proximity of the detector for 30 seconds before the alarm is activated. By placing the unit in the alarm mode, and placing an antenna or probe at the entry of a location, and remote locating the unit, anyone entering the location would be automatically scanned for surreptitious transmitters or RF transmissions. Telephone lines and handsets can be examined by using the audio feedback mode of the unit. This will determine if the telephone system has been compromised by hook bypass switches, infinity transmitters etc. The 360 can also be used for detection of vehicle transmitters that are typically intermittent or burst devices by setting the detector to the signal level mode and observing the meter indications for periodic pulse fluctuations. This test can only be made effectively with high quality detectors that have high end sensitivity. The Kaiser handheld infrared probe has a field of view of approx. 1 ft. at 3 ft. and will allow examination of a location for the presence of infrared surveillance devices. The Kaiser near field probe is most sensitive to RF signals only within close range (near field) and is insensitive to most other ambient RF signals except exceptionally strong broadcast signals. The probe is used as a transmitter locator rather than a broadband reception antenna like the telescoping wand. The near field probe will typically only receive the signal from the hidden transmitter if it is within several feet of the transmission source. This allows rapid and accurate acquisition of the location of the transmitter. In many cases the near field probe is all that is necessary to locate the surveillance device. Cosmetically the 360 unit looks brand new and operationally it is perfect. It has been recently serviced with new batteries installed and has been completely function checked and is in perfect working order. The detector comes with a Kaiser Infrared Probe, Kaiser Near Field RF probe, AC/DC fast and float charger, BNC antenna adapter, 10” BNC shielded extension cable, operators manual and a new Telex professional 610 series headphone set. 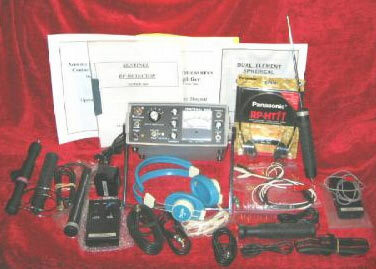 Included in the countermeasures set is a new ECM Tech Model CMA 1000 countermeasures amplifier with accessory kit. This unit is a high gain audio amplifier that is utilized to detect and identify surveillance devices connected to suspect wiring, amplify signals from an inductive probe for acoustic leakage, examine telephone wiring for the presence of surveillance devices and provide a variety of other tests used in countermeasures work. The CMA 7000 is one of the finest most versatile and powerful TSCM amplifiers on the market. It is a professional grade amplifier with a full 1 watt RMS power. The amplifier operates from a standard 9 volt battery, has a variable gain with volume control, selectable high pass and low pass filters and a variable impedance circuit. In addition to the standard 1/8 input for the test leads, it has an additional input for headphones and an audio output plug for connection to a recorder. The amplifier set comes complete with a 3” patch cable for connection to a recorder, 9 volt battery, Panasonic headphones, 48” test lead set with insulated alligator clips and two additional 18” jumper wires with insulated alligator clips in addition to the factory operator manual. Included in the countermeasures set is a new ECM Tech Model# 7003 acoustic leakage probe/contact microphone. This is a professional unit with a genuine AME heavy rubber grip handle with an attached 1/8” plug and the finest transducer available. This probe is used to detect acoustic leakage and works in conjunction with the CMA 1000 amplifier. The 7003 contains a high quality piezoelectric vibration transducer that is sensitive to vibrations thru solid materials and insensitive to airborne vibrations. The probe is placed against any solid object and will pick up any sounds. It is used on duct work, walls, windows and any other solid object to determine how much acoustic leakage is occurring. It is also used by private investigators for surreptitious monitoring and eavesdropping where legal. The probe comes with the factory manual. Included in the countermeasures set is a new ECM Tech (DESL) dual element spherical loop antenna. This antenna is professional grade and is specifically designed for countermeasures work. It has superior gain, clean reception and is designed to receiver those frequencies (500 KHz to 350 MHz) in the lower range which are difficult to receive with a standard telescoping wand antenna. The antenna features a chrome steel dual element design with a detachable AME rubber grip handle, BNC connector, and 3” shielded BNC connector cable. It comes complete with the factory manual. Included in the countermeasures set is a new ECM Tech Model# XL 3000 telescoping wand antenna with an AME rubber grip, BNC connector and 3” shielded BNC cable. Included in the countermeasures set is a new AlumaClad Professional carrying case with lock, keys, adjustable inserts, adjustable shoulder strap, document compartment and 11 small equipment pockets.